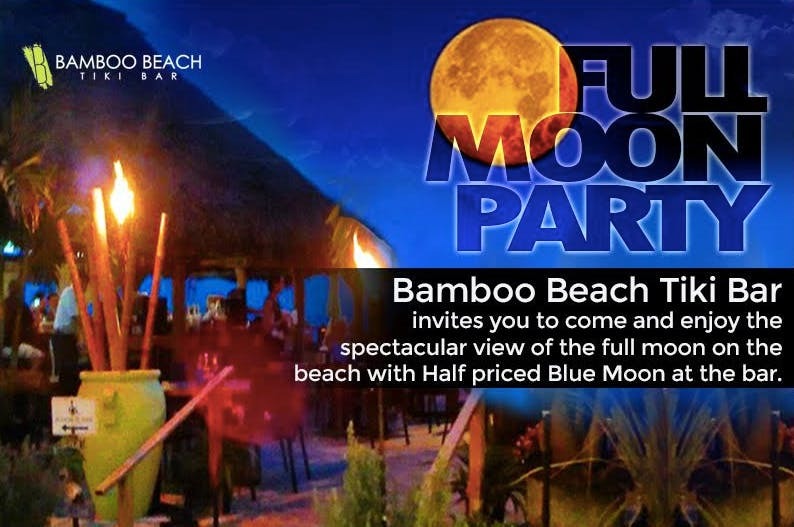 Experience the magic of the full moon on the beach at Bamboo Beach Tiki Bar! Enjoy great food, music, 14 flat screen tvs, and half priced Blue Moon. Plus a DJ. >> Featuring >> Full moon massages on the beach, hair braiding, and other spa features. Please check the OMm Salon & Spa page for availability. >> Featuring >> Full Moon Yoga on the Beach Community Class. 7:30-8:30 pm (one hour class) $15/person, cash only. Weather permitting. Mats provided. Call Sue to confirm and for details (516) 840–1455. Free parking is available in our lot just across the small street, or valet parking for a nominal fee. Located behind Ocean Manor Beach Resort at 4040 Galt Ocean Drive, Fort Lauderdale. Call (954) 566-7500 for more information.